Learn Flamenco in Spain & Enjoy Horse Riding, Walking & more too! In addition to our Flamenco classes, at Centro Flamenco La Fuente we offer a range of other exciting activities to make your experience with us complete. For more information about times and prices of the classes, please click here. We can also help to arrange the activities listed below. However, please note that the cost of these activities is not included in the basic price of your holiday. Let us know when making your booking if you would like further information and for us to make arrangements for you. 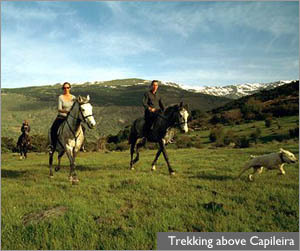 Just as the area is renowned for it walking, La Alpujarra offers some of the best horse riding countryside in Europe. The horses we offer are mostly Andalusian or Andalusian / Arab crosses, ranging from fifteen to sixteen hands (with a few heavier horses for less confident riders). Fit, happy and strong, they are well used to the mountain terrain and conditions, enjoy their work and are a pleasure to ride. 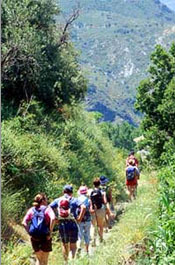 We can arrange private lessons (including dressage), and two hour or half day treks in the spectacular SIerra Nevada. 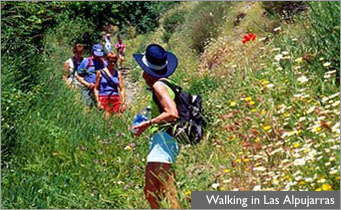 Las Alpujarras, the region of the Sierra Nevada in which the school is based, is world famous for it’s beautiful countryside and offers endless opportunities for walking and hiking. At the school we have a wide selection of maps and books that you are welcome to borrow for free, and many of the staff have their own recommendations for beautiful paths in the area. Alternatively, we can arrange expeditions ranging from a couple of hours day-long trips, with friendly and expert local walking guides. 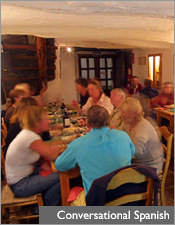 Whatever your preferred medium, whether its oils, watercolour, gouache or pastels, whether you are a complete beginner, an improver or an experienced artist, we'll help you to hone your drawing and painting skills in the mountains of Las Alpujarras. The landscape is truly inspirational, the quality of the light rich and powerful, the tuition expert, professional and carefully tailored to your individual needs. Whether you are a beginner or an improver, you will return home with new confidence in your art! Please Click Here. Practice with a qualified yoga teacher of more than 30 years experience and with a qualification from India. For more information about the yoga teacher, please Click Here.